Arc Angel is Jeff Cannata’s tool for rediscovering traditional AOR recipes, freshening them up a bit with a distinctive progressive rock twist. The end result is a truly tantalising musical cocktail. 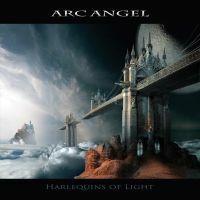 »Harlequins of Light« is a feast for melodic rock tropes, radio friendly rock sprinkled with shy progressive turns, as with “The Legend of Mary Celeste” and “Fortune Teller 2”. Interestingly enough, Jeff Cannata’s slightly gravely voice grants his performance the required grip on the slick melodic rock surface, ultimately raising “Voice of Illuminati” as one of the albums favourites. Jeff’s formidable musical experience makes room for “Tonight… Forever”, an ambitious, consolatory crossover between pompous rock and prog, that is sadly cut all too sudden in the end. Retreating far enough from any unnecessary musical experimentation, Jeff is keen on keeping things fresh and simple. Coming head on through adversity is his evident sense of melody, finished off with his fittingly bruised vocal delivery. This pays dividends on the searing ballad “Through the Night”. “California Daze” is predictable enough, but done in such an upbeat, uplifting style, that it makes your heart sweat with overexcitement. There’s also a huge amount of hope bursting through “Get to You”, and “As Far As the Eye Can See” is a reflective AOR gem building into a beautiful crescendo of life celebration.